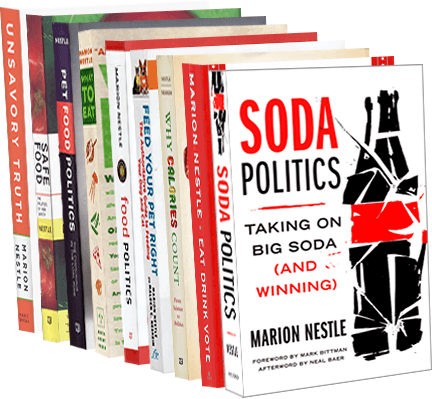 The Revolving Door: From CSPI to The Sugar Association? Politico Morning Agriculture (behind a firewall, unfortunately) reported this morning that Bruce Silverglade has filed a letter on behalf of The Sugar Association objecting to the FDA’s proposal to put Added Sugars on food labels. The objection is on procedural grounds. The Sugar Association opposes the FDA’s labeling proposal and wants the agency to allow more time for public comment (and, of course, additional time for lobbying against the measure). Silverglade is now an attorney at Olsson Frank Weeda Terman Matz. He joined this firm after resigning from the Center for Science in the Public Interest (CSPI), where he had worked as director of legal affairs for more than 25 years. CSPI has advocated for policies to reduce sugar intake for many years, and favors putting Added Sugars on labels (as I explained in a previous post). The “Revolving Door”—-exchange of positions between the food industry and government—often raises uncomfortable questions. This example, a move from a food advocacy group to The Sugar Association, is unusual. And sad. What do you think? Is the “Revolving Door” useful or conflicted? My post about the “Revolving Door” elicited a thoughtful response from Jerry Hagstrom, Founder and Executive Editor of the immensely useful Hagstrom Report, to which I subscribe. What would you have these people do for employment when they leave government? If they are political appointees, they can’t stay forever. Shouldn’t they use their knowledge? Should they be expected to move into an entirely different field? Wouldn’t it be a shame for the professional world of food and agriculture to lose their expertise? What about academics who take government jobs and then go back to academia? Don’t they learn how to get research grants? But their knowledge of how government works is considered valuable to universities and to students. Do you see any problem with someone being in government and then going to work for a nongovernmental organization or a foundation or coming from an NGO or a foundation into government? That happens too and those institutions have agendas. As a reporter I view all these people with a combination of faith and skepticism whether they are in government or out. Good questions, with no easy answers. Open Secrets provides many examples of government officials who become lobbyists for the industries they used to regulate. Conflicts of interest are likely to be even greater for those who revolve the other way—from industry to government–and especially when former industry executives move to high-level positions in regulatory agencies. If nothing else, I see the revolving door as giving the appearance of conflict of interest. Readers: What do you think? How would you respond to Jerry Hagstrom’s questions? The Center for Responsive Politics’ Open Secrets website is the go-to source for information about undue corporate influence in Washington. Among other juicy tidbits, it has some things to say about the “revolving door,” the trading of jobs between government and the industries it regulates. Although the influence powerhouses that line Washington’s K Street are just a few miles from the U.S. Capitol building, the most direct path between the two doesn’t necessarily involve public transportation. Instead, it’s through a door—a revolving door that shuffles former federal employees into jobs as lobbyists, consultants and strategists just as the door pulls former hired guns into government careers. According to the Hagstrom Report, Anne Cannon MacMillan, a deputy chief of staff to Agriculture Secretary Tom Vilsack, left the USDA to become the director of government relations for Roll Global, the California company founded by Stewart and Lynda Resnick, the owners of Pom Wonderful, Fiji water, and other brilliantly marketed food and beverage products. Robert Post, left his post as acting director of the USDA’s Center for Nutrition Policy and Promotion, the agency that brings us the MyPlate food guide, to join the Chobani yogurt company, as its senior director for nutrition and regulatory affairs. Former federal officials come to industry with deep knowledge of how the system works and how to beat it. They also bring long lists of key contacts who know how to make Washington work in the new employer’s favor. Oh yes. They also get paid better. Ethical? Revolving door appointments follow the letter of the ethics law. We can argue about whether they follow its spirit. I love keeping track of the revolving door between government food agencies and the food industry. Thanks to Food Chemical News for this latest example: Beth Johnson, interim undersecretary for food safety at USDA, resigned today to take a position as executive vice president of public affairs at the National Restaurant Association. Let’s wish her well on the new job and hope she helps restaurant owners stay out of food safety troubles. The revolving door: better than ever! Such things never cease to amaze. The Grocery Manufacturers of America, a lobbying and trade organization for the retail food industry, has just recruited Robert Brackett as its new senior vice president in charge of regulatory affairs. And who could possibly be better qualified. To take this job, Mr. Brackett will be leaving his position as director of the FDA’s Center for Food Safety and Applied Nutrition, the part of FDA that deals with food issues. I hope they are paying him tons of money.